THE BenRiach Distillery Company Ltd. is delighted today (October 10) to announce UK EXCLUSIVE bottlings from two single casks – one from BenRiach and the other from its sister distillery at GlenDronach. These limited release 1995 expressions, both bottled in August this year, were both matured in Pedro Ximinez sherry puncheons. These were originally used to store the characteristically sweet, full-bodied Spanish sherry that confers its distinctively rich and complex characteristics on the whisky. The result in both cases is fruit-laden heaven! First, the GlenDronach. From cask 4681, distilled in November 1995, this is a 15-year-old single malt bottled at cask strength – 56.2% vol. Its striking appearance is cherry-wood and russet mahogany. On the nose, there is chocolate orange and stewed plum while the palate delivers chocolate, toffee, spiced fruits, figs, raisins and dates. The cask out-turned 725 bottles, each of which is individually numbered. 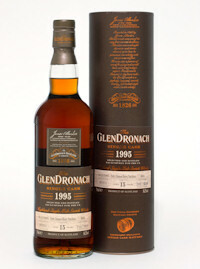 Complementing this monster GlenDronach is an equally substantial offering from BenRiach. From cask 7164 distilled in May 1995, this is aged 16-years-old and bottled at a cask strength of 58.3% vol. Its appearance is bright amber with a late autumnal glow. On the nose, bananas, citrus fruits and oregano while the palate brings melons, bananas and lychee. 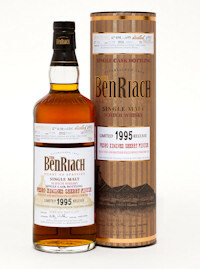 The out-turn on the BenRiach was marginally smaller, at 695 bottles. Again, each bottle is hand-numbered.